St Patrick’s Square is a special place in Auckland’s city centre – home to St Patrick’s Cathedral and an urban oasis offering respite from the hustle and bustle of life in the city. A full restoration of the Cathedral was completed in 2007. 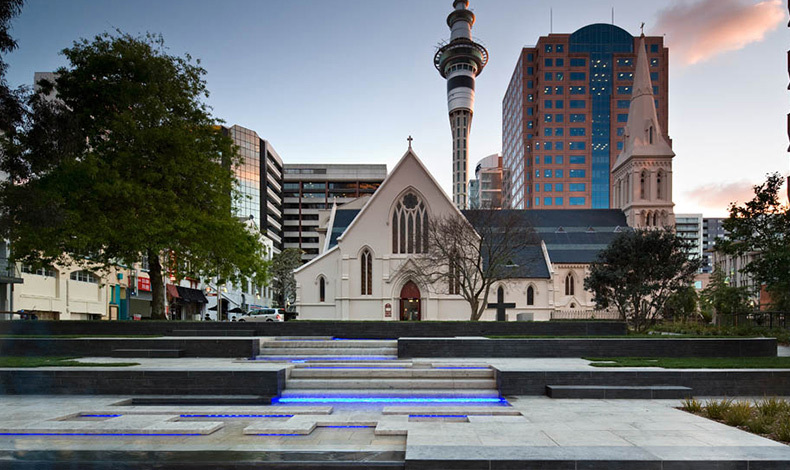 This, combined with a significant CBD Streetscape Upgrade Programme gave Auckland Council the opportunity to significantly enhance the existing Square and complement the newly restored Cathedral. Boffa Miskell was engaged as lead design consultant under a Partnering Agreement with Auckland City Council and delivered the complete range of project services from Site Analysis to Contract Administration. Extensive engagement and consultation with local residents, businesses and users of the Square resulted in a clear set of overarching project objectives. These included: celebrate the Square’s heritage, religious and cultural significance and its relationship to the Cathedral; retain and enhance the Square as an ‘urban oasis’ where people can relax, meet and socialise; create a safe, comfortable and enjoyable day and night-time environment, and use high quality materials befitting the unique nature of the place. Boffa Miskell worked collaboratively with two artists (Steve Woodward and Mary-Louise Brown) to create two distinctive artworks within the Square. Construction works were completed in October 2009. The project was awarded a Gold Award in the Landscape Design Category, and the NZILA George Malcolm Supreme Award at the NZILA Resene Pride of Place Landscape Architecture Awards 2010.